If you’re like most pet parents, you have struggled to give your dog a pill at some point. With a little advice and patience, you will be a pro in no time. Some medications are flavored, which means that you can just throw it down in the food bowl and most dogs will gobble it up - no problem. However, there are a lot of medications that aren’t flavored. Some even have a bitter taste and need to be disguised with something yummy to help your dog swallow it. One product that we love is called Pill Pockets. These are small, hollow treats that you put the pill inside of. Most of the time your dog will simply eat it. You can also ask us if something you normally have around the house will work for your dog. For example, barring allergies or interactions, you may be able to use peanut butter (with no Xylitol) or cheese to conceal a dose of medicine. Other times, you may have to “pill your dog”, meaning you will need to place it in their throat. If you have a dog that’s pretty easy going, you trust the dog, and you know that they are going to cooperate, then you can kind of push the pill down yourself. If the pill seems sticky on the outside, you can try wrapping the pill in sandwich bread, cream cheese, or butter to help it go down easier. Again, be sure to ask us if any of these "people foods" are a good idea! The easiest way to do this is to push your dog’s lips back, put your fingers just behind the canine teeth, and put his nose straight up in the air. (We're happy to set up a time with you when our staff can demonstrate!) With your other hand (holding the pill), open his mouth up and drop the pill in his throat as far as you can. Next you will want to shut his mouth, and gently to stroke his neck to help the pill go down. If he licks his lips after, you know that he actually swallowed the pill. Sometimes a "Spoonful of Sugar" Does NOT Help the Medicine Go Down! That is as easy as it will be for most dogs. However, if they are really struggling, if you’re having issues opening their mouth. or if you’re afraid of getting your hand bit, there are other options as well. One is called a pill wand; it’s a little plastic device that resembles a syringe. The tip of the wand has an opening where you can put the pill inside. With this device, you can reach the back of the mouth without having to put your hand in. Another helpful product is a clear empty gelatin capsule. These work great for pills that are bitter, or if you’re giving multiple pills to a patient (instead of giving three or four pills), you can put as many smaller pills in the capsule and only have to administer one pill. 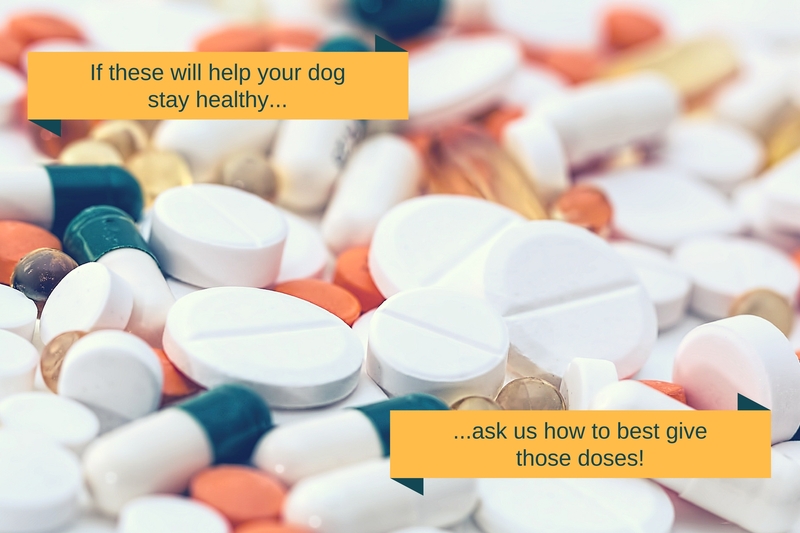 If you are still struggling to give your dog his medications, we are happy to give you more advice on what to do. Contact us here if you have any questions.